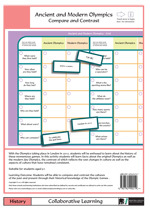 If you are a subscriber to the Collaborative Learning library, then you can download the pdf free of charge and print it out. But frankly, it is cheaper to buy the pack: all prints are made on cards which are longer lasting than photocopying paper. 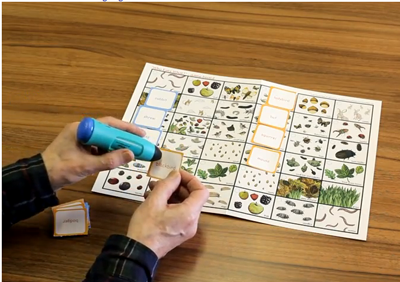 The cards are sound enabled for PENpal adding an extra dimension of narration, in English and other languages. All pictures are illustrated by professional artists. Game boards are laminated. Playing cards are perforated to give each a square edge. Each activity can be found in other languages using shared audio files for PENpal. So a Polish teacher, or Polish speaking Buddy, or a Polish EAL coordinator can translate key words and rules in Polish, and upload their version for others to share with the FREE ShareLINK software that comes with PENpal. If you have bought the activity you can also play it in Polish or any other language. 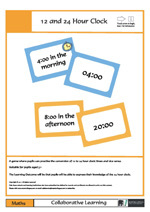 This game helps pupils to practise conversion of 12 to 24 hour clock times and vice versa. It also encourages the language of agreement/disagreement and of justification. There are a variety of ways of ‘telling’ the time.Learning Outcomes: Children will be able to make up amounts of 5 in different ways. They will know what the ‘exact amount’ for an item is. They will also have worked collaboratively with their partner. They say that cats have nine lives but even cats can be injured. 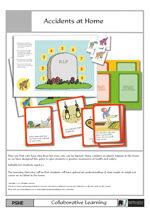 Many careless accidents happen in the home so we have designed this game to give students a greater awareness of health and safety.Learning Outcomes: Students will have gained an understanding of what might or might not cause an accident in the home. 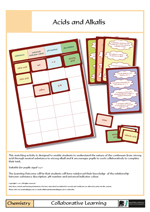 This matching activity is designed to enable students to understand the nature of the continuum from strong acid through neutral substance to strong alkali and it encourages pupils to work collaboratively to complete their task. Learning Outcomes: Students will have reinforced their knowledge of the relationshipbetween substance description, pH number and universal indicator colour. 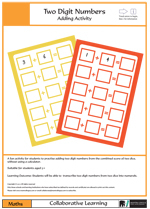 A fun activity for pupils to practise adding two digit numbers from the combined score of two dice, without using a calculator. This activity also encourages collaboration in the recording of the results. To vary the activity it can be played speaking the numbers in different languages or using different number systems. 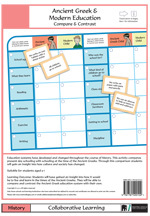 Learning Outcomes: Pupils will be able to transcribe two digit numbers from two dice into numerals. With the Olympic Games taking place in 2012 it is a good time to discover the origins of these games. There are many topics around this theme and if you develop your own please share them by sending them to the address below for expanding our library. Education systems have developed and changed throughout the course of history. To engage students with these changes we have devised this activity for them to compare their schooling with those of Ancient Greeks. If you develop your own activities around this theme please share them by sending them to the address below for expanding our library.Learning Outcomes: Students will have gained knowledge about the Ancient Greek education system and been able to compare and contrast it with their own. 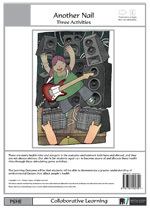 There are many health risks and dangers in the everyday environment both here and abroad, and they are not always obvious. Our aim is for students to become aware of and discuss health risks through stimulating game activities.Learning Outcomes: Students will be able to demonstrate a greater understanding of environmental factors that affect people’s health. Ethnic minorities have always come up against prejudice; even today many minority groups continue to suffer discrimination and oppression. However, no group has experienced such systematic destruction and dehumanisation as the Jews at the hands of the Nazis. 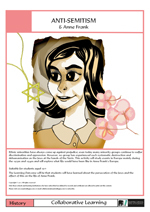 This activity will study events in Europe mainly during the 1930s and 1940s and will explore what life would have been like in Anne Frank’s Europe.Learning Outcomes: Students will have learned about the persecution of the Jews and the effect of this on the life of Anne Frank. 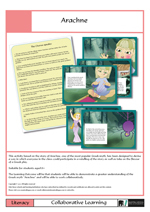 This activity based on the story of Arachne, one of the most popular Greek myth, has been designed to devise a way in which everyone in the class could participate in a retelling of the story as well as take on the flavour of a Greek play.Learning Outcomes: Students will be able to demonstrate a greater understanding of theGreek myth “Arachne” and will be able to work collaboratively.